Our SAH Branded after-sales back-up service is second to none. While looking through our website you may notice the SAH Branded logo. This indicates products that are covered by our exclusive Tackle Box Branded Product Lifetime Warranty. For example battery connections, Titan feet, bail springs or anti-reverse problems. Please halve the price stated in the reel service chart or call for further details. 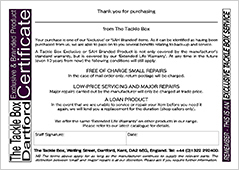 If we are unable to fix your faulty item before you next go fishing, or even halfway through a session. Due to the time factor in posting, this service is only possible for shop callers. 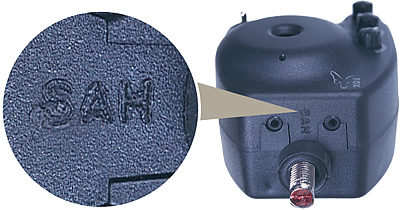 Bite alarms usually have to be sent back to the manufacturer for repair. For branded alarms we will not add any handling charge. Any cost will be charged at the manufacturer's rate only. No bivvy or shelter is guaranteed against storm damage. We will however try to help you out if your damaged bivvy or shelter was originally purchased from us. We will usually need to see the shelter in order to assess the nature of the damage and the cost of repair. HOW DO I KNOW IF A PRODUCT IS COVERED? All products on this website that have the SAH Branded Logo (as above) have been secretly branded (as below) before the sale to indicate they are a product supplied by The Tackle Box. A certificate will be supplied with all SAH Branded products but if you purchased a branded product from us, we can tell! We also sell a range of 'TB Exclusive' products that are covered by all the benefits of the SAH Branded Products Lifetime Warranty, but generally these carry The Tackle Box logo and will not have been branded. We always do our best to respond quickly and fairly to any problem relating to tackle purchased from us. In the event of a problem, call us straightaway (+44 (0)1322 292400) and we will do whatever is necessary to resolve it as fast as possible. An 'Exclusive & Branded Product Certificate' (shown left) accompanies each purchase. Our exclusive and branded products include all reels, bite alarms, Titan bivvies and selected rods.